WASHINGTON — Vice President Mike Pence on Monday accused the 2020 Democratic presidential field of being "afraid" to stand with Israel. 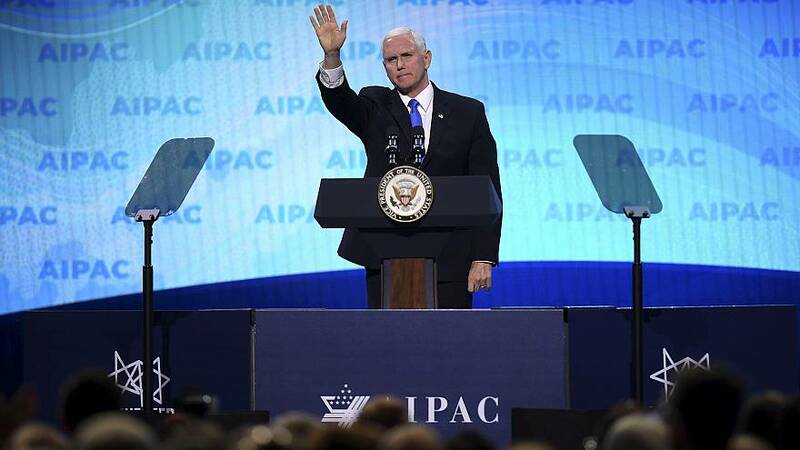 "Anyone who aspires to the highest office in the land should not be afraid to stand with the strongest supporters of Israel in the land," Pence said to raucous applause from the crowd at the American Israel Public Affairs Committee's annual policy conference here. "It is wrong to boycott Israel and it is wrong to boycott AIPAC." Liberal groups asked 2020 Democratic hopefuls to avoid the event, and most have stayed away from the conference. It's not clear which, if any, of the Democratic contenders were invited to speak; emails seeking comment on that question from multiple campaigns and spokespeople for the AIPAC conference went unreturned. New Jersey Sen. Cory Booker, who is seeking the Democratic nomination, was expected to attend the conference to speak to his state's delegation. But at a conference where bipartisanship is typically emphasized as a strength in promoting ties between Israel and the United States, Pence tried to persuade the audience that Democrats are abandoning their commitment to defending the relationship. "It's astonishing to think that the party of Harry Truman ... has been co-opted by people who promote rank anti-Semitic rhetoric," Pence said. Without mentioning her by name, he pointed to the controversy surrounding Rep. Ilhan Omar, D-Minn., who has been rebuked by Republicans and Democrats for a series of remarks offensive to Jewish people. "Anti-Semitism has no place in the Congress of the United States of America," he said. "Any member who slanders those who support the historic alliance between the United States and Israel... should not have a seat on the House Foreign Affairs Committee." Pence's remarks follow weeks of Trump trying to persuade Americans that Jewish voters are leaving the Democratic Party in droves — a claim for which he has provided no evidence and which is odds with larger trends away from Republicans and toward Democrats in Jewish voting patterns in recent elections. Earlier this month, Trump said Democrats have become "anti-Israel" and "anti-Jewish." While the Democratic Party has struggled with opposition to Israel on its left flank, Trump has been accused of insensitivity to anti-Semitism in the past. Critics have pointed, in particular, to his conclusion that there were "very fine people on both sides" when white nationalists chanting "Jews will not replace us" clashed with protesters in Charlottesville, Va., in 2017 and the closing ad of his 2016 campaign, which featured the images of several prominent American Jews and anti-"globalist" rhetoric. The audience at AIPAC, however, has been very pleased with his policy toward Israel, which has mirrored the desires of hard-liners. Trump officially moved the U.S. embassy in Israel to Jerusalem, pulled out of the Iran nuclear deal and recently announced that he would recognize Israel's claim on the contested Golan Heights region.